This entry was posted in Computer, Database, Murmuring, MySQL, Programming, Software and tagged compression, database, db, dictionary, innodb, mysql, pinterest, python on January 31, 2017 by Gea-Suan Lin. 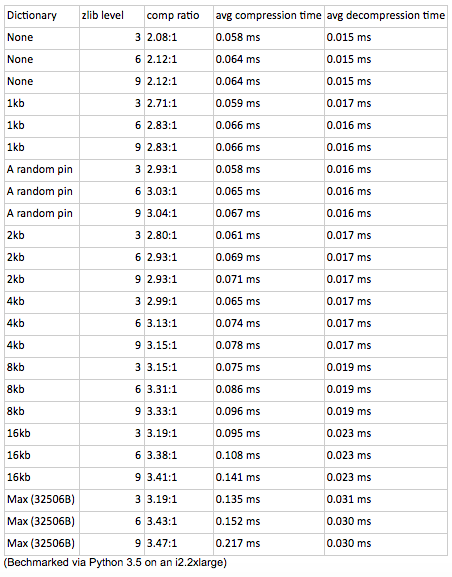 A Pin is stored as a 1.2 KB JSON blob in sharded MySQL databases. Zlib version 1.2.7.1 was released in early 2013 and added the ability to use a predefined “dictionary” to prefill the lookback window for LZ77. This seemed promising since we could “warm up” the lookback window with field names and other common strings. We ran a few tests using the Python Zlib library with a naive predefined dictionary consisting of an arbitrary Pin JSON blob. The compression savings increased from ~50% to ~66% at what appeared to be relatively little cost. Below is a graph from our presentation which showed a read-only version of our production workload at concurrency of 256, 128, 32, 16, 8, 4 and 1 clients. TokuDB is in yellow, InnoDB page compression is in red and the other lines are column compression with a variety of dictionaries. We worked with Percona to create a specification for column compression with an optional predefined dictionary and then contracted with Percona to build the feature. This entry was posted in Computer, Database, Murmuring, MySQL, Software and tagged compression, database, db, innodb, json, mysql, percona, pinterest, xml, zlib on October 20, 2016 by Gea-Suan Lin. This entry was posted in Computer, Murmuring, Network, Programming, Software and tagged apache, cache, daemon, pinterest, zookeeper on March 16, 2014 by Gea-Suan Lin.